UBC Okanagan Professor Kathleen Martin Ginis chats about physical activity with tennis player and UBC student Rob Shaw. For decades, the main message to keep the general population healthy was for everyone to get active. In fact, the World Health Organization laid out specific guidelines (150 minutes of cardiovascular exercise each week) on how much physical activity was required for people to maintain a healthy lifestyle. However, UBC Okanagan researcher Kathleen Martin Ginis says while the recommendations were well-meaning, a particular group of people was excluded. Now, an international committee, led by Martin Ginis, has come up with exercise recommendations for the SCI population that will be presented at the International Spinal Cord Society Annual Scientific Meeting in Dublin, Ireland this week. It is recommended that to improve fitness, adults with SCI should engage in at least 20 minutes of moderate to vigorous intensity aerobic exercise two times week and three sets of moderate strengthening exercise for each major functional muscle groups two times per week. To improve cardiometabolic health, at least 30 minutes of moderate to vigorous intensity aerobic exercise is needed, three times per week. It’s a specific dose, she adds, for a reason. Cardiometabolic illnesses—cardiovascular disease, diabetes and even obesity—are among the leading causes of death in adults with SCI and addressing cardiometabolic health is extremely valuable, she adds. To determine the exact prescription, the international team looked at more than 200 previously published studies; all of which examined the effects of exercise interventions (e.g., cardio, strength-training) on cardiorespiratory fitness, muscle strength, bone health, body composition and cardiovascular risk factors for people with spinal cord injury. Stakeholder groups, people with SCI, and exercise scientists were also consulted. 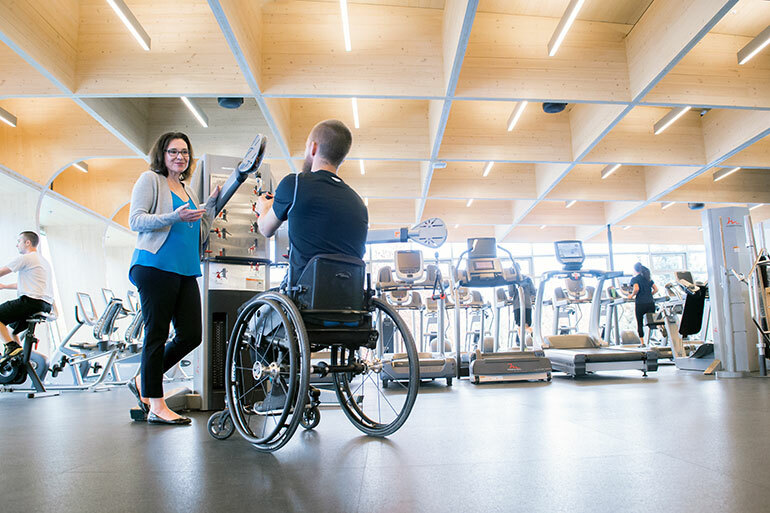 The study was partially funded by the Rick Hansen Institute (RHI), a Canadian-based not-for-profit organization that drives innovation in spinal cord injury research and care. Hansen, a three-time Paralympic gold medalist, says these guidelines will make a significant difference to the lives of many people. The research is published this week in the journal Spinal Cord. Other funders include Loughborough University, the UK Higher Education Institute, and the Social Sciences and Humanities Research Council of Canada.